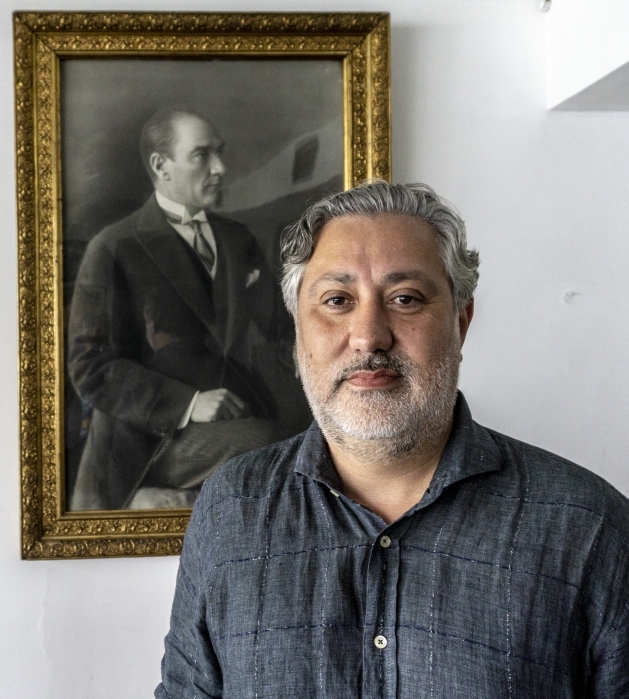 Murat Sabuncu in Cumhuriyet's headquarters, in front of Atatürk's portrait. The newspaper defends the secularism and democracy Turkey's first president stood for. Nov 01 (IPS) - Censorship, controversial judicial proceedings and imprisonment: such is the current risk run by independently-thinking journalists in Turkey. Reporters Without Borders ranks Turkey 157th out of 180 countries in its World Press Freedom Index, describing the country as the ‘biggest jail for journalists in the world'. The authorities have raided and closed many media outlets, censored social networks and the internet, even ignoring decisions of the Constitutional Court after a state of emergency was established post the failed military coup in July 2016. One of the latest changes believed to be part of this transition happens to be the change in leadership of the independent newspaper Cumhuriyet. On September 7, 2018, following the meeting of the new board, former editor-in-chief Murat Sabuncu resigned along with several other journalists who questioned its impartiality. Several sources confirmed that the new administration was elected with the help of public authorities and that they started turning a blind eye on events critical of current government. They have already been scrutinized for underreporting on issues related to the Kurdish people or past prison massacres. Cumhuriyet has been Turkey's oldest and much trusted newspaper for almost a century. This editorial change may lead to a shift in the reporting of issues such as human rights, gender equality, secularism and protection of the environment. These issues have been fearlessly reported by Murat Sabuncu and his editorial board during recent times. In 2015 Cumhuriyet was awarded the Freedom of the Press Prize by Reporters Without Borders in recognition of its defence of liberal values in the face of Turkish Government pressure. The year after, the newspaper received the Right Livelihood Award for its ‘commitment to freedom of expression in the face of oppression, censorship, imprisonment and death threats'. In October 2016, four months after the coup and following a denunciation from members of the current board, Mr Sabuncu, along with other colleagues, was detained and imprisoned without charges. He was then convicted of collusion with terrorists and sentenced to seven and a half years in prison. Mr Sabuncu and colleagues were released in March this year, pending the result of their appeal to the Turkish Supreme Court. This is the last interview of Mr Sabuncu as editor-in-chief. As a part of the government's reaction to the 2016 'coup d'état' the media in Turkey have suffered from shut-downs and the arrest of journalists. What exactly are the accusations that the government has made against the media? And what is the nature of the evidence to support those accusations? Each and every time its democracy was interrupted, Turkish intellectuals have paid the price, with journalists taking first place. This process was at work during past military coups, and it is now taking place under the current AKP government, which has increased its pressure in recent years. Lately, several journalists have been arrested, charged and convicted for being members of a terrorist organization or of helping organizations associated with terror. Evidence varies from case to case, but they all have in common their involvement in the communication of "news stories, articles or social media posts". As a journalist, I am appalled and saddened that accurate reporting of "news" should be considered as constituting a "crime". Furthermore, the charges were shown to be unfounded. As a whole, our newspaper was incriminated for having "supported every terrorist organization in Turkey". Everything private, our belongings, our houses, our bank accounts (our own but also those of our partners or ex-partners over the previous 30 years) were controlled. Of course, the authorities found nothing that was incriminating. To give you an example, one of the charges levelled against our columnist Hakan Kara and cartoonist Musa Kart was that of having telephoned the ETS Tour agency to book holidays. It turned out that this company was under investigation for links with the Gülenist organization, former allies of the government and now held responsible for the coup attempt. As a consequence, the telephone call was used to incriminate the two journalists. Are there any aspects of the process that distinguish the case of Cumhuriyet from that of other press outlets? After that plea, I remained imprisoned for another nine months. In April of this year, I was sentenced to 7½ years in prison. If the Supreme Court approves the sentence, I will spend three more years in prison. However, there are many journalists who were tortured, imprisoned or assassinated at different periods in Cumhuriyet's history. Perhaps what distinguishes Cumhuriyet from other news outlets in Turkey is our determination to tell only the truth, no matter how difficult the circumstances. Now we are paying the price for doing that, just as we have in each previous, non-democratic era. Do the authorities want to make an example of you in order to intimidate any independent investigation media? Without false modesty, Cumhuriyet is potentially Turkey's most influential newspaper. Foreign and domestic ambassadors, politicians or journalists regard it as the most neutral and enlightened medium outlet here. They read it to be informed on what is really happening. As it always defends democracy and freedom, it is de facto perceived as an opponent to any party violating these values. Consequently, it is logical that an anti-democratic and illiberal authority will want to stifle such a journal. As happened for example with Hürriyet, another newspaper which was financially sanctioned for a while, then bought by a mogul close to the president such that its reporting is now aligned with that of government opinion. However, there are still many independent media in Turkey. Although less influent, some like Evrensel and Birgun remain important. But with the current economic crisis, Cumhuriyet ends up by being the only one able to cover certain stories, like the 700th gathering of the ‘Saturday mothers', families of people who forcibly disappeared after the military coup in 1980. Some would say that Cumhuriyet keeps strong links with political parties, threatening its neutrality? Ahmet Şık, with whom I shared my prison cell, one of our main investigative journalists, has just joined the Peoples' Democratic Party (HDP), which is left-wing and pro-minority. As long as he worked for Cumhuriyet, he did so as a journalist, and exclusively as a journalist. As soon as he announced his decision to engage himself politically, we immediately stopped his collaboration with us just as we had done with another of our correspondents in Ankara right after he joined the CHP, Turkey's main opposition party. No doubt they won't be the only journalists to engage themselves politically in Cumhuriyet's history, as can happen with any other media organisations. But I refute the accusation of Cumhuriyet as possessing any political affiliation. Going back to the trials that lasted from July 2017 to April 2018, on what basis have you lodged your appeal? We describe what news reports we conveyed. We argue the case that journalism should not be considered as a criminal activity. We state that the charges are an attempt to intimidate journalism through us. Is there any distinction between the basis ofyour appeal and that of your colleagues? I have not read the appeals of others. But I have always said the same thing since the first day. We do not want freedom and the delivery of rights just for ourselves. We demand that everyone be judged independently, on a level where the principles are dominant, not the people. There are still journalists, lawyers, deputies, and rights advocates in prisons. We were lucky to be from Cumhuriyet newspaper. But many people, unknown and unmentioned, are still in prison only for their opinions. We want everyone to benefit from our country's laws. What elements do you consider might influence the outcome of your appeal(s)? On September 9th, it is six months since I left prison. Since then, I have been working at the newspaper every day, weekends included. Neither the sentence I was given nor the court's upcoming decision crosses my mind. I do my job. I do it with love. The appeal is not my problem. It is the problem of my country. I will bow to the will of my readers and of democracy, not to that of a few powerful men. I won't leave the country out of fear but will remain among my fellow citizens. Are we to be a country that believes in the rule of law, or are we going to create traitors in each era, to exploit them for political ends? Those who sentenced us know very well that we are only newsmen, people engaged in journalism for 30 to 60 years in this land. In any case, History will make its own judgement. What do you see as being the key points that describe the current state of your journal/the media in general within Turkey? Ninety-five per cent of the media in Turkey is under government control. There are 2-3 newspapers, including Cumhuriyet, 4-5 news websites and a few TV channels that continue to resist. The price of resistance is to either lose one's freedom or go bankrupt because advertisers fear the government. But news is a necessity. True and accurate news is indispensable for any real democracy. So, the media will sooner or later create a model in which it can breathe more easily. I needed to cross a strong security barrier to enter your building. Is that related? It is. Defying the authorities can create many enemies. But we especially had to adopt strict security precautions after we published the Charlie Hebdo's cartoons in 2015. What are your hopes and fears for the future of the Press within Turkey over the immediate future? I have no fears, but I do have a great amount of hope, because there is a majority of young people believing in democracy for my country. There can be no room for fear if my country is to see happier days, when no one is alienated and the rule of law is respected. Hope and struggle are needed. How do you consider that the current economic difficulties in Turkey might influence the situation of the press? The Turkish press must buy its paper from abroad. Now both paper prices have increased, and the lira has lost value. An already difficult economic sustainability has become even more difficult. The news websites and TV channels lose commercial support if they are not close to the government. The economic crisis will make conditions even more challenging. Beyond the current economic crisis, Cumhuriyet itself is suffering from an advertisers' embargo for fear of potential government retaliation. We have almost no advertising revenue right now and our sales have dropped to approximately 40,000 copies/day, although 1.3 million persons still check-out our web pages every day. Do you consider that the current situation of the Press will change now that the ‘state of emergency' is being terminated? Turkey is in a perpetual state of emergency. Nothing has changed in terms of freedom. But this is not limited to my country. The whole world is going through a crisis because of the actions of autocratic leaders such as Trump, Putin, Orban… But are others so innocent? What about the European leaders negotiating over the lot of immigrants, each of whom is a human life? Only the people and those who strive to uphold freedom will change the world for better. Don't expect this to come through the politicians. Do you see the current situation as being a systemic illness in the state of Turkey or the result of individual political decisions? Both are true. Democracy has never functioned fully in Turkey. Every political period and government conducted its own witch-hunt. Now we're going through such a time. But it is also a fact that the most recent years are among the most oppressive that Turkish democracy has had to withstand. What factors do you think influenced most the outcome of the recent elections within Turkey, resulting in the confirmation of the current government? It resulted from several weaknesses within the opposition. Another point was a lack of strategy from the opposition CHP, the social-democratic party's most brilliant candidate trying unsuccessfully to imitate Erdogan's style and populism. Why would Turkish people have chosen another party with similar rhetoric and style? Do you believe that the current government could improve the position of the press within Turkey and even the country as a whole within the current political set-up? I have enough experience to know that it is wrong to expect change from the government alone. The public must embrace freedom by engaging in civil society organizations, by entering politics, and expressing more of their democratic demands. The situation of the opposition parties is taking the country to an even more difficult stage. We will see new political entities and leaders in the upcoming period. What do you consider that the Right Livelihood Award might have/has done to change the situation of yourself and press colleagues in your predicament? The editorial principles, set out by our founder and first lead author Yunus Nadi in Cumhuriyet's first issue published on May 7, 1924, are found in the preamble to the Official Deed of the Foundation: "Cumhuriyet is an independent newspaper; it is the defender of nothing but the Republic, of democracy in the scientific and broad sense. It will fight every force that tries to overthrow the Republic and the notion and principles of democracy. It will endeavour for the embracing by society of the principle of secularism along the path of ‘Enlightenment' ushered in by Ataturk's revolution and principles. Cumhuriyet, which adopts the "Declaration of Human Rights and Fundamental Freedoms" as the universal constitution of democracy, deems by way of basic principle that its goals may only be attained within the independence and integrity of the Republic of Turkey established by Atatürk." We will continue our struggle to keep those principles alive. The award gave us strength to do so.